Observation - Caddis fly - UK and Ireland. Description: This rather attractive little moth came the moth trap. Now know his is not a Caddis fly not a moth. This rather attractive little moth came the moth trap. 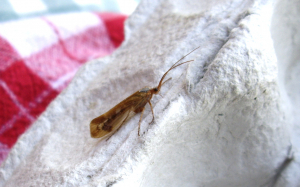 Now know his is not a Caddis fly not a moth.